The M-series TVRs (the M was for new TVR boss Martin Lilley) were designed to be sold to a wider audience than previous cars, so were made more habitable, and offered with a range of engines. They were nine inches longer, mostly in the nose, and built on a dynamically improved, stronger and more rust-resistant chassis. The 1600M was powered by the Capri GT ‘Kent’, and only lasted just over a year to 1973. The heart of the M-Series range were the six-cylinder cars. The need for two different engines in the Tuscan’s replacement was due to the UK market’s 3.0-litre Ford V6 not meeting US emissions standards. So cars heading to the USA were fitted with the straight-six TR6 engine. They were primarily intended for the USA, but a few were sold here. The 3000M was the big seller, though, and once the TR6 passed away and engine supplies dried up, it became the only six-cylinder M-Series car. Interestingly the 1600M was reintroduced with a mild restyle and bigger alloys in 1975 in the wake of the 1973-’74 energy crisis. It didn’t last long – but today is surprisingly sought after. 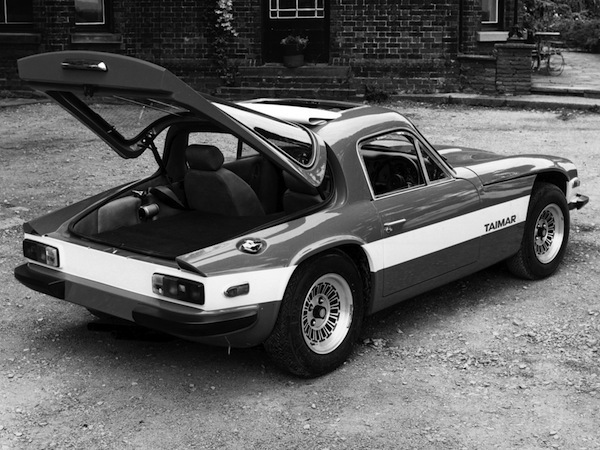 The Taimar was big news for TVR when the wraps came off it in 1976. It answered a long-asked question of TVRs and provided proper external access to the boot via a large hatchback. The appeal was obvious and, despite a price premium, the Taimar became TVR’s most popular model.